This route is the easiest and strongly recommended! The quickest and easiest way to claim and set up the WiFi for your device is to use the Particle Tinker app on your smartphone to directly connect with the Argon and give it the WiFi network information. You can quickly get a link to download the app on your phone by visiting Particle Setup and providing your phone number. It’ll text you a link you can then use to grab it from the App store. If it’s not already, make sure the LED on your device is blinking deep blue. If it’s not, just hold down the SETUP button for 3-5 seconds and try the steps again. If you’re using the app for the first time, follow the on-screen prompts and use your Particle account information to sign into your account. Existing Users: To setup a new device, click the + icon on the top right corner. 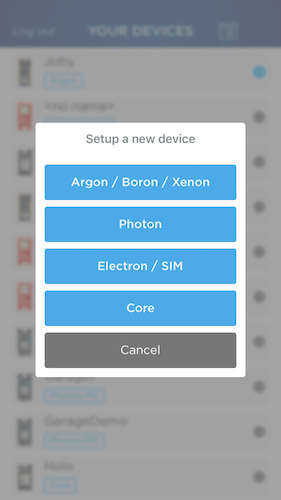 Follow the in-app prompts to claim your Argon. These are illustrated below. To set WiFi credientials your Particle device needs to be in listening mode. To check, just make sure the LED on your device is blinking deep blue. If its not, just hold down the SETUP button for 3-5 seconds and try the steps again. Tah Dah! You’re all set to start using your Argon! Particle devices remember the last WiFi network they were connected to, but if you change networks you have to tell it each time it should connect to a new or different network. To do this, just put the device in listening mode (blinking deep blue) by holding down the MODE button for 3-5 seconds and follow the instructions in Step 6.